The Ramon Roqueta Winery has a history that goes back 120 years and five generations of the Roqueta family. The winery was founded in Manresa in 1898 by Ramon Roqueta Torrentó, an enterprising and ingenious businessman, from a family closely linked to viticulture since the 12th century. He moved to Manresa as he foresaw an opportunity to sell and distribute products in this city which was growing. This proved to be a decisive milestone that laid the winery’s first stone. Since then, the winery has proven its commitment and respect to the winemaking tradition, as well as great loyalty to its origins, which lie in the region of Bages within the province of Barcelona, a region with a longstanding and reputable tradition in viticulture. The winery has also demonstrated its great capacity to adapt to changes that the wine sector has witnessed in recent centuries, yet without forsaking its identity at any time. Ramon Roqueta represents modernisation and adaptation to new times in a business with century-old traditions and know-how. Ramon Roqueta wines reflect the essence of the figure of Ramon Roqueta as an entrepreneur, winemaker and merchant, as well as the values linked to the winemaking tradition in the Roqueta family. The Roqueta family’s experience in winemaking has been documented since 1199, with references to the Roqueta farmhouse, known as Masia Roqueta or Mas Roqueta, as it was called then, although we can also find references to the name Guerau Roqueta in 1170. The house is located in the township of Santa Maria d’ Horta d’Avinyó within the region of Bages. Nowadays, the farmhouse continues to display vestiges of centuries dedicated to winemaking, such as presses, stone vats, stone deposits and huts, as well as mills and barrels. Mas Roqueta is one of the houses in the township of Horta that survived the Black Plague, the agricultural crisis and King John II’s wars which resulted in significant depopulation in the countryside. Documents that have been preserved state that in 1377 the estate was owned by Jaume Roqueta, who then passed it on to Pere Roqueta in 1407. During the following centuries, the Roqueta estate and home remained in the hands of the Roqueta family and there are well-founded references to their winemaking activity. In 1898, Ramon Roqueta Torrentó (1875-1938) laid the foundations so that his family’s activity would take on the dimensions of a business. He did this when he moved to Manresa, the capital of the Bages region, and he started to commercialize produce from his family’s farm, and this consisted mostly of wine and potatoes which were staple commodities at that time. Ramon Roqueta was the first major driving force in the winemaking business in Manresa. He set up his business in different parts of the city until 1919 when he built a new building on a street called Carretera de Vic. It was to house a living area, a warehouse and a store. This is where he located the company’s headquarters. Ramon Roqueta Torrentó was very active in social and civic organisations in the city. He served as Town Councillor with Manresa’s City Council from 8 February, 1920 until 2 October, 1923. In line with the business founder’s commitment to business, from 1923 on, he was a member of various guilds for wine merchants. One of Ramon Roqueta Torrentó’s most significant roles was with the Wine Merchants’ Guild in Manresa where he was treasurer until 1927, the year in which he was appointed President of the Guild, and a position he held until 1936. 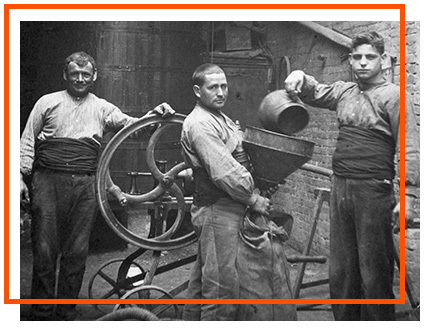 In the 1920s, Ramon Roqueta Torrentó started to develop the company’s identity. He commissioned headers for letters to Josep Algué Marigot, a famous cartoonist and painter, who had a modernist style. Valentí Roqueta Prat would maintain the design later on. Ramon Roqueta Torrentó registered the company’s first commercial vehicle, the “20 HP Truck”, with a local industry board. Thanks to Ramon Roqueta’s initiative, the winery launched the production of sparkling wines under the brand name “MUNDIAL” (which means “world”). The vehicle, whose registration was B-5622, bore the image of Gran Espumoso MUNDIAL (the world’s great sparkling wine) in an advertising campaign which appeared in the town square- the Plaza Mayor- in Manresa in 1924. Ramon Roqueta Torrentó started to export wine by signing the company’s first contract for the sale of wine in France. The contract was signed by Establisements Vidals (Saint Fons. Rhone, France). They bought 100 barrels, 400-500L in size, of red wine with a volume of 11.5 to 12 degrees. This deal was made through the collegiate representative Mr. Jaume Ristol. Valentí Roqueta Prat (1896-1979), who had been working since he was 13, took charge of the family business upon the death of the winery’s founder Ramon Roqueta Torrentó, and at a time in which the country was in the throes of the Civil War. This successor was responsible for modernizing the company. Ramon Roqueta Roqueta officially joins the business. Valentí Roqueta Prat was the driving force behind a new phase to adapt the business to the current times. He built a large warehouse on land the winery had already acquired next to the existing building- It was on a street called Carrer de la Sèquia and had a surface area of 931 m2- It was used to house the tanks with Valencian tile, the bottling plant and other services. In 1958 he establishes the first “Distributors Convention” at the Roqueta premises in Manresa. Valentí Roqueta Prat followed in his predecessor’s footsteps and began a long-lasting relationship with the Catalan Wine Association (Asociación Vinícola Catalana), and he was also very active with the trade union movement in Manresa. Valentí Roqueta Prat was behind the first advertising campaigns that were designed to strengthen the brand’s image. He was extremely interested in the company’s quality and image, so he developed a new image which he entrusted to prestigious artists, such as the renowned artist from Manresa Joan Vilanova Roset. 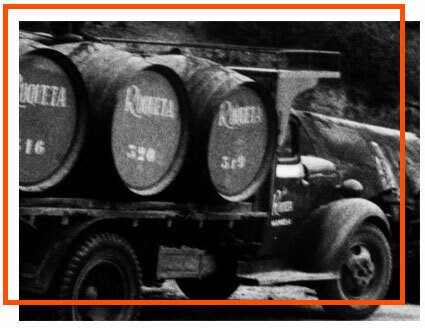 The great vision that characterises the winery continued to thrive and in 1963 Roqueta opened its first bottling plant, which meant that the winery no longer had to sell its wine in barrels nor in bulk, but in bottles. The bottling plant was expanded in 1970. From 1967 on, Valentí Roqueta Prat invested in establishing the “ROQUETA” brand by producing editions of a pocket calendar which changed every year and which usually featured the business’ new products. Ramon Roqueta Roqueta (1925-2018) took over as president of the winery. During his time at the forefront of the company, the winery went through a period of great expansion with regard to its brand and the establishment of a solid distribution network throughout the country. Ramon Roqueta Roqueta was very committed to the city of Manresa and thanks to his enterprising spirit, he served as Manresa City Mayor between 1975 and 1978, as well as President of Montepio de Conductores, an automobile association in Manresa. He was also a member of the board of the Catalan Wine Association (Asociación Vinícola Catalana), where he was president between 1999 and 2010. He obtained several medals and honorary recognitions for his intense dedication to the world of wine, as well as the honorary Medal of the City. To adapt the company to the demands of the times, the company set up Bodegas Roqueta, S.A., led by Ramon Roqueta Roqueta. To promote its wines, Roqueta initiated a new era to open up new markets. In 1980, the wines were showcased for the first time at the prestigious international food fair “Alimentaria ’80”, and in the Catalan fair for wine and cava, “Mostra de Vins i Cavas de Catalunya”, which is held in Barcelona. From that moment on, the winery has been ever-present at numerous fairs and exhibitions on a national and international scale. Valentí Roqueta Guillamet joined the company as its CEO. He initiated a phase of expansion by intensifying exports and by launching new products on the market, thus accentuating the winery’s modernization. Following in his family’s footsteps, with the enterprising and civic spirit that characterizes them, Valentí Roqueta Guillamet has always been committed to his city, society and the country. He became involved in, and in some cases, presided over several entities and received numerous awards in recognition of his contributions. His most notable achievements have been within the wine sector, such as the promotion of the region of Bages with an end to obtaining the appellation of origin, or DO, Designation of Origin Pla de Bages, a feat he achieved while chairing the Regulatory Council from 1995 to 2015. Since 2014, he has also chaired the Catalan Wine Association (Asociación Vinícola Catalana). Valentí Roqueta Guillamet has followed in his father’s, grandfather’s and great-grandfather’s footsteps by being a force in enterprising activities with the Official Chamber of Commerce and Industry in Manresa. He was president of the Chamber from 1983 to 1986. In 1987, he was awarded the Gold Medal for Merit by the Superior Council of Chambers of Commerce, Industry and Navigation in Spain. The Ramon Roqueta brand was created in memory of the founder who opted for quality when the business started to bottle varietal wines. Over the years, labels were changed on several occasions, and led to the design that appears today. Calendars to promote the Ramon Roqueta brand. In 1994 the TÜV Rheinland company granted the Roqueta winery with the ISO 9002 quality certification. In 2006, the ISO 22000 certification was awarded to the winery, and it was the first company in the entire state to receive this stamp of quality. In 2010, Roqueta was awarded the IFS (International Food Standard) certification. These certificates are evidence of the Ramon Roqueta Winery’s commitment to quality in its wines. The Roqueta family celebrates a 100 year anniversary which honoured the beginning of its commercial winemaking activity in Manresa. Valentí Roqueta Guillamet’s son, Ramon Roqueta Segalés, joined the family business. Like the generations that preceded him, he is very committed to civic and enterprising undertakings. He is an active member of several institutions, among them the Official Chamber of Commerce and Industry in Catalonia, the board of the Denomination of Origin Catalonia and the Catalan Wine Association. A new image and identity for Ramon Roqueta’s range of wines was presented. It paid tribute to the values that its founder, Ramon Roqueta Torrentó, wanted to evoke in his wines back in 1898. These values are still relevant and prevalent today. Ramon Roqueta Insignia Col·lecció Privada 120 Aniversari is launched to pay tribute to the legacy initiated by the winery’s founder Ramon Roqueta, a legacy which has been kept alive by his successors.